Collectors ripping 2012 Topps Football may have found redemption cards good for a free pack of Kickoff cards. The program was intended to send collectors to their local shops where they could get their special packs starting on September 5. Get complete details and a full checklist for the 2012 Topps NFL Kickoff program. Here we are, still in August, and several of the cards are already being listed on eBay. Singles, lots, packs, autographs -- all can be found. And Topps isn't happy about it. Last night, they called several sellers out publicly via their Twitter account, blasting the message out to their more than 30,000 followers. 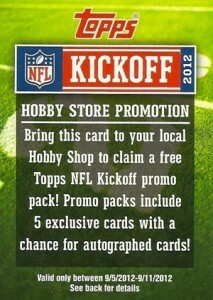 They also encouraged collectors to contact them if their local shops were selling the 2012 Topps Football Kickoff packs. Topps even promised to make it "worth their while" for reporting shops abusing the program. We have found our Topps 2012 NFL Kickoff Promotional Products on sale through your eBay account. Please understand that this promotion is authorized for and intended only for in-store execution by Hobby Stores that are Authorized Topps Dealers. These products are not for sale or resale at any value, in any venue, or any retail format. Placing our products on eBay is inconsistent with the spirit of this promotion; therefore, we are asking that you remove them immediately. Further, our Hobby Stores have been given advanced warning about using our promotional materials outside of program guidelines. If we find that your account is in any way linked to an Authorized Topps Hobby Shop Dealer, please understand that the Hobby Store will face punitive action from Topps up to and including suspension of their direct buying privileges from Topps and permanent exclusion from any future Topps promotions. We value our Hobby Stores and respect their ability to execute our programs with integrity. We ask that you please remove these products so that our Hobby Stores can execute this program as it was intended—in Hobby Stores Only. This strong stance doesn't apply to those selling the redemption cards themselves. They're just taking action against those selling cards the prize cards themselves that are intended to be given out free. For every 2012 Topps Football Kickoff card, collectors get a pack of five cards. Random autographs are also inserted. The promotion does have a short window, though. Collectors must take their cards to participating shops between September 5 and September 11. Collectors have long complained about dealers abusing promotions like this. This is the first time a card company has publicly taken a stance. 2012 Topps Kickoff #48 LaMichael James RC San Francisco 49ers Rookie Card! I know there was a lot of controversy about the tweets yesterday but I support Topps 100% in their actions. I’m definitely glad they followed up their tweets with an official notice to the sellers. If this were the earlier 2000’s, I’d probably see a little more the argument that this was unprofessional. Today is the day of social media though. Odds are pretty good that many retail shops are involved in social media and follow Topps. What faster way is there to get the word out than via social media. I love that Topps took a stand to protect us, the collectors. My hope is that they’re not empty threats as that would simply encourage this kind of behavior but I have to assume they’re taking this very seriously. I hope they follow up as well. Unfortunately many won’t heed the warning. I would love to see Topps suspend a dealers card privileges. I think that’s what it will take for Hobby Stores to take it seriously. But this is the country in which we live. Anybody looking for an opportunity too make a quick buck will do so. Rules or no rules. Anyway..bravo Topps. Hopefully the others start following your lead. I think Topps can go **** themselves. Once I have possession of an item, I can do with it what I please. If any Topps representatives are reading this, you are welcome to contact me and make an appointment to meet me.